Your most memorable Valentine’s Day yet is waiting on the water, when you and your sweetheart join us aboard the Odyssey for dinner! Enjoy delicious cuisine and live entertainment with a view of Washington, DC on this 3-hour dinner cruise along the Potomac River. On board the elegant Odyssey cruise ship, choose from one of three exquisitely decorated glass atrium dining rooms or head to the open-air observation deck to admire the view. Dine on a delicious 3-course meal, then dance the night away or see the famous sites of the nation’s capital — like the Washington Monument, the Lincoln Memorial, Reagan National Airport and much more under a moonlit sky. Stunning skyline views, inspired cuisine and an experience unlike any other all make for the perfect celebration of love. Make your way to the Gangplank Marina, where boarding begins at 6pm for a 7pm sailing time. Follow a sightseeing route along the Potomac River with fascinating views of DC’s famous monuments and the city's historic waterfront. The Odyssey is a modern dining ship with three exquisitely-decorated glass atrium dining rooms that offer amazing river views from every table, as well as an open-air observation deck and dance floors. Meet the Captain and crew, pause for a shot with the ship's photographer, then sit down to a three-course dinner that includes a tasting trio, entrees and desserts. After the meal, dance the night away to live music that ranges from softer standards to high-energy hits. 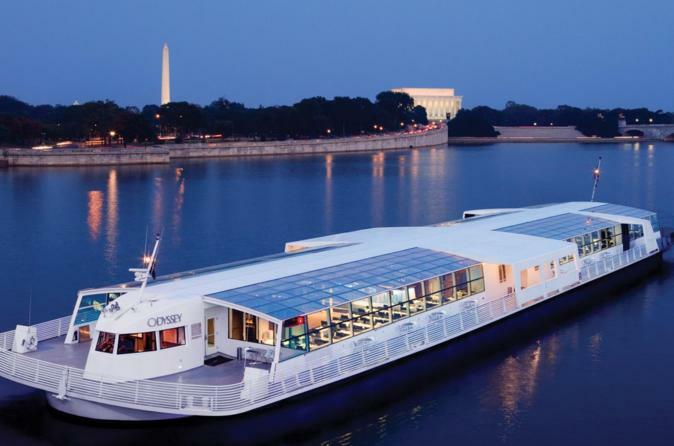 Throughout the cruise, enjoy stunning views of the Washington Monument, the Lincoln Memorial, the Thomas Jefferson Memorial, Arlington National Cemetery, the Kennedy Center for the Performing Arts, Reagan National Airport, the United States Naval Research Laboratory, Old Town Alexandria, the Woodrow Wilson Memorial Bridge, and much more. This 3-hour dinner cruise concludes at the original departure point.